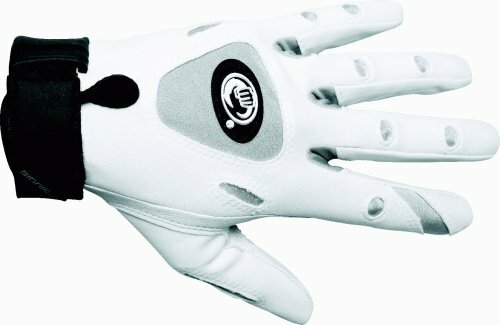 The Tennis Gloves are specifically designed to maximize your game. The lightweight breathable material will help your hands stay cool and comfortable during play. Anatomical Pad System maximizes grip strength, promotes a lighter grip and reduces hand fatigue. Twelve terrycloth mini-towels inside the glove helps absorb moisture to keep hands dry to keep your grip on the racquet secure. CoolonTM moisture control material on back of hand evaporates perspiration rapidly while offering flexibility and comfort with the racquet. Form-fitting wrist closure supports the wrist to give added stability without sacrificing flexibility and motion. Full-leather sheepskin combined with CoolonTM Lycra material is completely washable. If you have any questions about this product by Bionic, contact us by completing and submitting the form below. If you are looking for a specif part number, please include it with your message.